If your choice is similar to one of the 12 examples in the pictures above please just tell us which one and what size and we'll send you a quote. 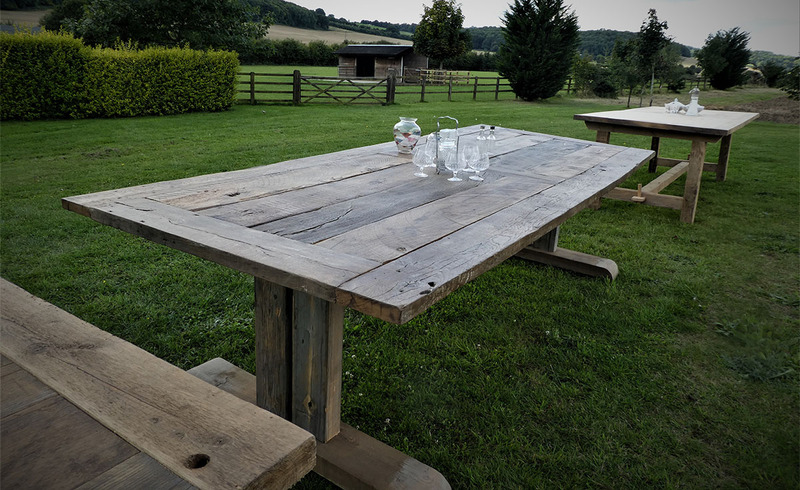 Our mission is to use our vast stock of ethically-sourced, reclaimed timber and our honed carpentry skills to craft a table which is Unique to You. We are continually searching for new sources of special timber - be it from Victorian Mills, old French Barns, Romanian Shepherd Huts, Devon Sea Groynes or an early 19C Belgian Railway Carriage. Our everchanging stock of of beautifully aged solid woods allows you to choose from the best. Whether Oak, Pine,Elm or Ash or other species, each reclaimed find will have its own rich history, depth of grain and special character. We provide a truly bespoke service in terms of size, design, choice of wood and finish and if you'd like to make your table more portable (e.g. to move it outside) then our Seperable Base Option may help. If you have an image of the timber you would like or a particular idea of your table's design in a picture then please don't hesitate to send it with your enquiry. Want a Banquet Table to Seat 20 Places? The Bespoke Green Table company is among an elite few who can source and craft tables which will seat from 8 to 20 people - just provide us with your choice of timber, your required dimensions and type of finish and we'll make it - uniquely for you. Our craftsmen take great pleasure in sensitively reclaiming the rich legacy of woodwork gifted by previous generations and are happy to use their skills to make your table a unique treasure.